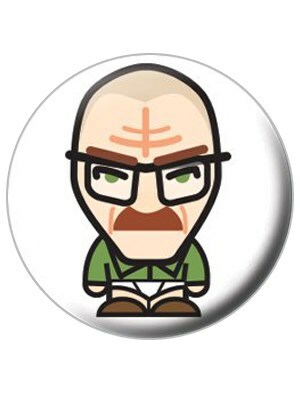 Television Button Badge: If you love smash hit TV show Breaking Bad then this cartoon button badge of the main protagonist Walter White is perfect for you. Seen here in cartoon form with his trademark bald head, wide rimmed glasses and meth cooking attire which incidentally consists of his underpants and a shirt you can show your love for the sensational show with this awesome button badge. High quality, framed Walt Cartoon, Breaking Bad badge with a bespoke frame by our custom framing service.